High compressed air quality is critical in the electronics and chip manufacturing industry. You simply cannot afford downtime or product spoilage with oily or wet compressed air. At Q Air-California, we provide manufacturing and electronics industries with oil-free air compressors that completely eliminate the risk of oil getting into the air stream. We recognize that you have a lot at stake depending on the quality of your air. The presence of oil, condensation, oil vapor, and particles can lead to downtime, product damage and recall, damage to your brand reputation, harmed consumers, and even product liability. When it comes to manufacturing chips and other electronics, you can count on Q Air-California to offer solutions that mitigate risks and ensure delivery of the highest purity of compressed air possible to minimize the risk of production interruption, product damage, or higher cost liability. We will help you to select, install, and maintain the right air compressor system for your semiconductor and electronics manufacturing applications. High quality oil-injected compressors can deliver oil-free air, thanks to the integrated, multi-stage oil removal filters. However, there have been a few cases in the past where these compressors have resulted in oil contamination, despite having several stages of oil removal. With oil-injected compressors, there is always the risk of contamination and the likelihood of severe consequences for your production process and the end product. This is particularly troublesome due to the increase in air temperature after compression and before it passes through the filter. The filter performance is normally specified at 20°C (68°F). But if the ambient temperature in the compression room rises to 30°C (86°F), then the compressor outlet temperature could reach 40°C (104°F), while the oil carryover could reach 20 times this value. When the hot, compressed air passes through the oil removal filters, the oil carryover via the filter media increases significantly depending on the temperature at the filtration interface. Even in colder climates, these temperature changes remain more or less the same because the room where the compressor is will always be at a higher temperature than outside. When using an oil-based air compressor, you must constantly monitor the effectiveness of the filters and replace them if traces of oil are found when you test the quality of compressed air. The manufacture of chips and other electronic components involves the use of sensitive, high-tech equipment that require a massive capital investment for the operator. The equipment is designed to use a huge amount of compressed air, like for operating sensitive valves or conveying components pneumatically. The air used for these applications must obviously be free of any oil, water, and other contaminants. 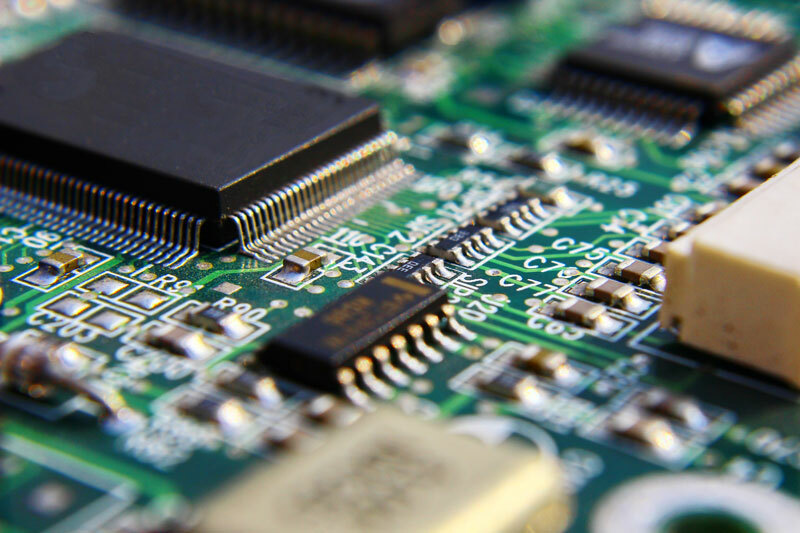 PC board cleaning - applications in the electronics and chip manufacture industry, including PCB cleaning where compressed air is used to blow dirt off of the boards post production, require clean, uninterrupted compressed air. Powering pick and place machines - the compressed air produces the energy required to operate pneumatic conveyors and other machines. To maintain profitability, manufacturers must be able to keep their operating costs low while producing products in high volumes. The electronics industry depends on oil-free air compressors that can run 24/7 with minimal maintenance requirements or contamination issues. At Q Air-California, we understand that the quality of compressed air in your various applications is not something that you can take for granted. As such, our experienced engineers work with you to identify the ideal oil-free compressors for your needs. When you’re assured of clean, safe, and consistent quality air supply, you can focus on more important business operations that rake in the profits.